Séjour très agréable dans cette grande résidence sécurisée avec tennis et piscine, service de bar et restauration légère, super plage avec emplacement de transat attribué, appartement cosy et très bien équipé, comprenant un pack accueil pour le petit déjeuner du lendemain, et savon et shampoing de qualité, bref tout ce qu'il faut pour passer d'excellentes vacances à la Barbade ! We have just spent 14 days at this wonderful apartment. Everything about it was just as described if not better. The pool and beach areas were superb and the apartment itself was comfortable and extremely well equipped. Any advice or help was dealt with by quickly and efficiently by Jaimie, and Keishas visits twice weekly kept everything immaculate .Glitter Bay itself is quiet and peaceful and ideally situated. We loved every minute of our stay and can't wait to go back. It was a nervous return to Barbados for us, after 19 years ! We booked the holiday to celebrate my husbands birthday, and after spending a lot of time on the island with a lot of happy memories, before we had our children , we returned with our 3 teenage boys not sure what to expect. We needn't have worried as we were made to feel welcome as soon as we arrived. The driver was there to meet us as promised at the airport and on arrival at the apartment Eleanor was waiting outside to greet us. The apartment is beautiful, clean and spacious. Now home in the cold we are already missing the outdoor balcony, with its views over the pool and gardens, where we had our breakfasts and evening drinks. Waking up to the sounds of the birds, and watching the family of monkeys playing from the balcony [ with their 3 babies ! ], then listening to the crickets at night was amazing.Eleanor looked after us really well and the apartment was always immaculate, and we even organised for groceries to be delivered there for our arrival through the owners. They have everything really well organised.The resort of Glitter bay was perfect, with one of the best beaches on the island, a lovely pool, and tennis courts which the boys also used. Sunbeds are allocated on arrival and are yours to keep for your stay, so you don't need to rush down to the beach in the mornings ! There are plenty of beach bars within walking distance along the beach, we enjoyed lunch at the Glitter bay Beach bar and at the Fairmont Royal Pavillion next door. These both stay open until the evening for drinks too..perfect for sunset and watching the flying fish. Be warned the Fairmont beach bar also shows football !! Which is kind of a double edged sword. Annoying if you have men that really can't bear to miss the premier league even when you are away for the week somewhere amazing , but also great if you are travelling with teenage boys as it enables you to enjoy 90 minutes peace and quiet in the sun .We were pleased that the West Coast hasn't been overdeveloped still, and has improved for the better, with a wider selection of bars and restaurants and the Limegrove shopping centre all nearby. There is a good selection of bars and restaurants , of all price ranges from rum shops and beach bars to the amazing restaurants. Lonestar is a short walk along the beach and is fantastic with great atmosphere. The resort is in a great central location. Would definitely recommend it and we will return soon. Thank you ! 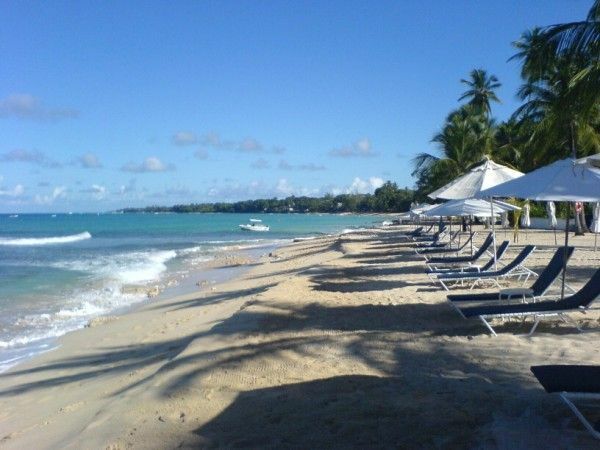 This was our first visit to Barbados and the apartment fully lived up to our expectations.The apartment has two great bedrooms with the best of furniture and linens, and a wonderful balcony for lazy breakfasts and lunches. Careful thought went into every aspect of this apartment and it is ideally located for a great beach vacation. Many thanks for the welcome pack which was gratefully received, and many thanks to Eleanor for her kind attentions. Thank you for sharing this lovely apartment with us. An immaculate apartment in a lovely setting. On arriving at the apartment, we were impressed by the cleanliness and attention to detail of everything. Lovely crisp white sheets, fluffy white towels and beautiful furniture. We were recommended this apartment by my brother who had stayed here previously and it did not disappoint. The location of Glitter Bay on the West Coast of Barbados is excellent. Lots of lovely restaurants in Holetown or a 10 minute stroll on the beach to JuJu's for lunch and Lonestar for lunch or dinner. We also had lunch at the Glitter Bay beach bar which was very good. A car is recommended however as the walk into Holetown can take 30-45 minutes on precarious paving which is sometimes non-existent! Finally I have saved the best til last and must mention Eleanor the maid who looked after the apartment to an extremely high standard. Nothing was too much trouble for her. I would have no hesitation in recommending this apartment. This apartment is just perfect! It was our second visit to Glitter Bay, but our first time staying in 207. We were met by Eleanor, the Maid, with a cold bottle of Prosecco and Sprite for the children. Throughout our 3 week stay, Eleanor was an absolute pleasure to have around. She goes the extra mile for her guests and keeps the apartment in superb condition. You really couldn't ask for anything more to be included in this apartment, it has everything. Our children, aged 12 and 15, vote Glitter Bay their best ever holidays as it has everything that children could want - super pool, beautiful beach, completely safe, amazing friendly staff, awesome wildlife (turtles, monkeys, crabs, tropical fish etc etc) and lots of other children to play with. And for adults it's pretty perfect, too! There is a fairly new lunch bar that has opened up the beach - just past the Lone Star - called Santi, that we would highly recommend for lunch. And Alan (the GB barman) makes a mean Rum Sour! We will definitely be going back to Glitter Bay, and to apartment 207! Please note that VAT of 7.5% is applied to the nightly rate. We do offer one bedroom use of Palm Trees for one or two persons; please let us know and we will advise the reduced rate. Please contact us for late booking offers.